It takes a book like Modern Essentials to prove to me just how little taste I have. Apparently, people actually decorate their homes in different themes or color schemes. They don’t just adorn it with whatever furniture is on sale at their local Pier 1 or the nearest discount furnishing outlet. They actually put thought into their homes. 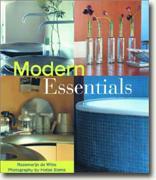 Actually, Modern Essentials is a helpful book, particularly for those with a new home. It teaches you what colors go together, what pieces can help round out your look, and how pretty bottles of toiletries count as decorations. All kidding aside, it turns out that my apartment does have a theme – it’s called soft design, decorated predominantly with pastels. Who knew? That’s one of four “looks” that Rozemarijn de Witte and photographer Hotze Eisma illustrate in the book, including natural, new classical and color and contrast. The photos, as one would expect, are lovely and luxurious and will make you hate your bargain basement coffee table. Still, unlike most books of this sort, Modern Essentials isn’t all about envy. There’s a section in the back called “Practicalities” that actually gives new homeowners practical advice on the ins and outs of creating a new home. There’s advice on nearly every aspect of home design, from painting to installing security to fireplaces to flooring (carpeting trick – bend a carpet sample back on itself and look at the edge. If the pile isn’t dense enough, you will see the base exposed on the edges – particularly useful if you are carpeting your stairs). True, Modern Essentials isn’t going to turn you into a home design guru overnight. But it will give you some insight for the next time you buy a home, or plan to refurbish the space you’re currently living in.